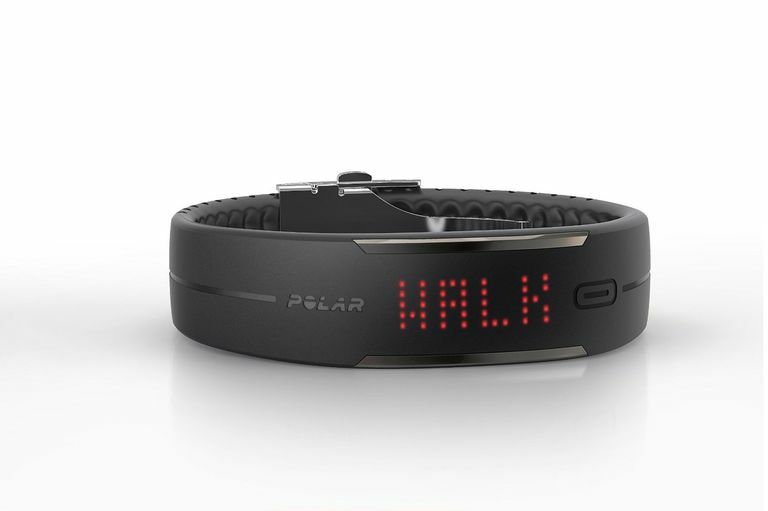 The Polar Loop wristband pedometer packs a lot of features beyond tracking steps and calories. Its biggest difference from others is that it can also link to Polar heart rate monitors via Bluetooth, so you can view your heart rate on the Loop during workouts. But even if you don't add the heart rate monitor, the Loop excels at coaching you to be more active and reduce inactivity time, and it also tracks sleep. The original Loop has been updated as the Loop 2.
Who is the Polar Loop Right For? The Loop fits if you're a couch potato who needs motivation to move more, but it won't feel too simplistic if you decide to get serious about fitness or train for a marathon. If you add a Polar heart rate monitor you can track your workouts in detail with the Loop. It provides suggestions on how to reach an all-day goal by a combination low-intensity, moderate-intensity, and high-intensity activities. You decide how sweaty you want to get to reach the goal. The Polar Loop connects to PC (Windows XP and later) or Mac (OSX 10.6 and later) computers via a custom USB cable and links via Bluetooth Smart to iOS mobile devices (iPhone 4S and above, iPod touch 5th generation and newer). You can sync your data with either the mobile app or the USB cable and view your data either online or on the app. There are no ongoing fees to use the app or online dashboard. Power: Recharge the battery every three to six days with the custom USB cable. It saves seven to 12 days worth of data before it would need syncing to free up data storage space. Heart rate training sessions take up more data space. Watch Display:. Press the single button to view time (hours and minutes), steps, all-day calories burned, and an activity goal indicator. It also shows you the hours and minutes you need to log to reach your activity goal with three intensities: "Up" (low-intensity activity), "Walk" (moderate-intensity activity) or "Jog" (vigorous-intensity activity). If you add a Polar Bluetooth Smart heart rate monitor strap, you can see your heart rate and whether you are in a fat-burning zone or fitness zone. Steps: The Loop tracks all-day steps. It recorded the same number of steps as the Fitbit One worn on my waistband. It doesn't track steps for specific workouts. Calories Burned: The Loop tracks all-day calories burned. It doesn't have any food logging features. You can track your weight by entering it manually. If you use the heart monitor strap, you will also get a total of calories burned in that exercise session. Low-intensity activity: This includes standing, moving very slowly, light chores. If you did nothing more vigorous, I (as an office worker over age 50 and female) would get to the goal with 7 hours, 19 minutes at this level. Medium intensity activity: walking and other moderately-intense activity. I found that most of my walking, even when not brisk, ended up in this category. I would need 2 hours, 11 minutes if I had no other activity. High-intensity activity: jogging, running, cycling and other vigorous-intensity activity. I would need 58 minutes to get to the goal with no other activity. Sitting time is also tracked, with inactivity alerts when you haven't gotten up in an hour. Your daily activity is shown as clock graph on the app and Polar Flow dashboard. Each minute is color-coded for activity intensity. You can see when you were active throughout the day. You also get a total time for each type of activity, plus inactive (sitting or lying down) time and time asleep. To track workouts, you need to add a Bluetooth Smart heart rate monitor strap. Polar recommends their H6 and H7 bands. Other brands may or may not work. Pair it with the Loop by bringing them close together and it will say "Paired" and the workout starts. It ends when you take off the monitor. That makes it a no-brainer, but also makes for embarrassing public displays when putting your monitor on or taking it off under your shirt. During the workout, you can view your heart rate and it tells you with an "EnergyPointer" whether you are in a fat burning zone or a fitness zone. You can't set any other heart rate zones or get in-zone and out-of-zone alerts. You can also scroll through your usual display (time of day, all-day steps, all-day calories, activity goals). After a session, you can view your workout on the Polar Flow site or in the app and see more details. These include a graph showing your heart rate minute by minute during the workout, average heart rate, maximum and minimum heart rate, time in five different heart rate zones, workout calories burned, total time. If you want to track your heart rate workout in even more detail, including speed and distance and logging a map, you can use the Polar Beat app instead. But if you use it, you can't view your heart rate on the Loop. You have to choose before the workout. In both cases, you will see the details on the Polar Flow dashboard. Sleep: The Loop automatically detects sleep time (if you sleep lying down). You get a total sleep time but no further analysis for deep or light sleep. You can use the activity clock display to see times you may have gotten up during the night. Inactivity Alerts: If you haven't gotten up and moved in an hour, the Polar Loop app sends you a message to remind you to get up. It also gives you an Inactivity Alert triangle on your activity clock and records the number of times you got an Inactivity Alert on your daily summary. Combined with tracking total sitting time and advising you in their activity analysis that you sat a lot all day, it can motivate you to sit less. Mood: You can manually track your mood with the app or website. Activity Analysis and Coaching: In addition to viewing the activity totals, you can also see analysis on how your level of activity that day can benefit your health and fitness, graded from one to three dots. During the day, the app and website give you suggestions on activities that can meet your activity goals, such as minutes of handball, baking, gardening. Data: You view daily, weekly and monthly activity graphs and totals on the website or app. On the website, you can delve into your fitness progress and review workout sessions by type, totals, best sessions, and more. You have all of the power of Polar heart rate training to explore. Social: You can either have a public profile, one only visible to approved followers, or keep it all private. There is no automatic way to post summaries or workouts to social media if you are using the Polar Loop. Portability: You can use either the app or the USB cable for syncing and must sync every seven to 12 days or lose data. You have to use the custom USB cable to recharge the battery every three to six days. You can't adjust the activity goal, so it may be disheartening to people who are sedentary and need to work their way up to meeting the goal. Very active people may also wish they could increase it to challenge themselves. No workout tracking unless you add a compatible Bluetooth Smart heart rate monitor. You can't manually enter other workouts into your training diary or totals, only what the Loop detects. No tie-in with a diet-tracking program. No distance estimate and it doesn't detect elevation changes to track stairs. You have three ways to see how you are being active all day -- the display on the Loop, the Polar Flow website, and the app. I love the ease of use of the app and its easy syncing with Bluetooth Smart. The integration with a Polar heart rate monitor takes this from being a lifestyle activity monitor to being a fitness performance tool as well. Disclosure: E-Commerce Content is independent of editorial content and we may receive compensation in connection with your purchase of products via links on this page. Review samples were provided by the manufacturer.